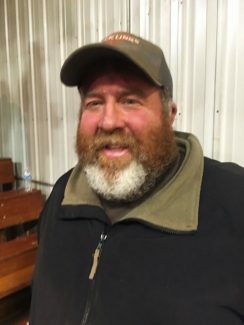 Shane Basinger, Forestburg, S.D., bid on several bulls and bought one. Location: at the farm, Artesian, S.D. 49 Angus bulls averaged $5,015. Lot 710 at $15,000 MOORE 345 456 Dob 2-11-2017 Reg 18943653, Moore 902 Focus 008 x Moore Ft Knox 146 sold to Tam Griepentrog, Hankinson. N.D. Lot 708 at $10,000 Moore 345 514 Dob 2-10-2018 Reg 18943645, Moore 902 Focus 008 x Moore Capitalist 514 sold to Jon Millar Sturgis, S.D. Lot 715 at $9,500 MOORE 345 427 Dob 2-22-2017 Reg 18943662, Moore 902 Focus 008 x Moore Guiness sold to Rod Campbell. Colchester, Ill. Lot 741 at $9,000 MOORE RESOURCE 363 Dob 2-26-2017 Reg 18943698, SAV Resource 1441 x Moore 902 Focus 033 sold to Rod Campbell, Colchester, Ill. Lot 745 at $8,500 MOORE RESOURCE 227 Dob 3-4-2017 Reg 18943703, SAV Resource 1441 x Moore Denali 527 sold to Grassel Brothers, Artestan, S.D.